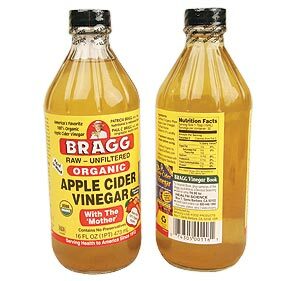 I was recently reading up on how wonderful apply cider vinegar is for your entire body. Apple cider vinegar contains natural enzymes, vitamins and minerals and antioxidants. It contains vitamins A, B and C, bioflavonoid, calcium, phosphorus, copper, magnesium, silicon, boron, etc. You get the point. It is that wonderful! It is also a natural anti-fungal and an antiseptic. It not only improves skin tone but is a great method to rid yourself from acne. Plus it helps with metabolism, so you can shed pounds easily (more on that at a later post). Here is a natural way to apply it as a everyday toner. Mix apple cider vinegar with water in equal quantities and apply it on face directly with a cotton ball. Do this once a day, everyday. You'll begin to notice a difference in your skin within 2 weeks! Have fun trying this out!